Bang the Table Engagement Manager Jeremy Shackett shares strategies to sustain community engagement. The end goal of community engagement is not just to secure a few hundred survey responses for your next project, but to actually cultivate an engaged community. The traditional public outreach process involves hosting a few public meetings, posting materials on the city website and community boards as legally required, and sending an e-blast with a link to a survey. Once you have checked those boxes, it is easy to think you have completed the public outreach process for that project. Rinse and repeat. ‘Public outreach’ is a short-term, transactional process by definition. It is easy to implement and produces quick short-term results. Who doesn’t like a quick sugar rush? Community engagement, however, is hard at the beginning. Who wants to open themselves up to a two-way conversation with the public and potentially face community criticism head-on, or look out five years into the future when they need survey responses now? Who actually likes broccoli? An engaged community, however, trusts your organization. 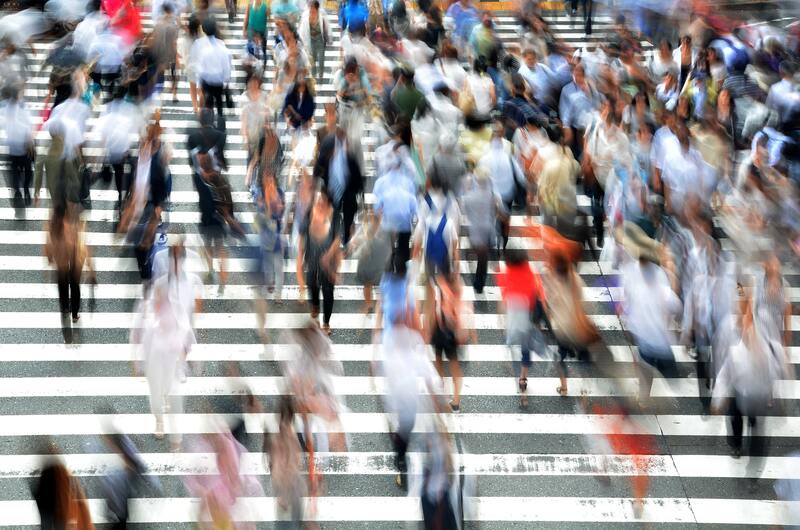 An engaged community makes your organization more resilient to external stresses or internal shakeups. And, yes, an engaged community can get you those few hundred survey responses as well. Even if an organization is supportive of long-term engagement, it might be daunting figuring out how to implement the approach. Most of our clients’ approaches to community engagement fall into one of two buckets: top-down, or bottom-up. Some communities have such a large volume of projects that they can execute a top-down approach. 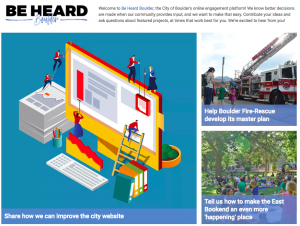 For example, the City of Boulder, Colorado uses their Be Heard Boulder online engagement platform to engage on multiple citywide initiatives — from the city’s transportation plan to the Boulder Fire Rescue Master Plan. Many of these consultations bring in stakeholders who are passionate about one issue. Then, once those people are signed up into the platform, they can “cross-pollinate” and engage on other issues much more conveniently. This gives them access to richer feedback and more moderate voices steering the dialogue. But this begs the question, what about those who also want to cultivate an engaged community but do not have the capacity to deploy this sheer volume of projects? Commit to engaging residents once a month, no matter what. This could mean deploying a silly survey or poll that doesn’t have too much effect on long-term outcomes. We have seen local governments engage about what makes a good pie, or vote for what movie they want to see in the summer ‘movies in the park’ series. Send regular newsletters that bring participants back from month to month and familiarize new users with the engagement process. Use existing channels to drive traffic: public meetings, social media, or even just handing out business cards to the public that carry the engagement site’s URL. Whichever method you choose, it is vital to ‘close the loop’ of engagement. This refers to what you do after the public feedback window has closed: demonstrating to the public that their input has been heard by sharing the details of the feedback you received. This can take many different forms: as simple as a newsfeed update or a newsletter with a summary of the findings, and some key comments that were representative of the community’s response. Other clients have taken a more sophisticated approach. 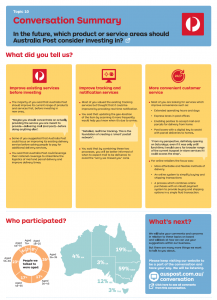 The Australia Post, for example, created a graphical conversation summary sharing the key findings, in a compelling and eye-catching document. One of those comments even had some snark built into it, and it was a huge trust-builder to include it in the document nonetheless! With these examples in mind, I encourage you to eliminate the phrase “public outreach” from your vocabulary. Technology now enables us to connect with residents easier than ever before. But the flip side is, these same technological advancements allow residents to talk to each other easier than ever before as well. 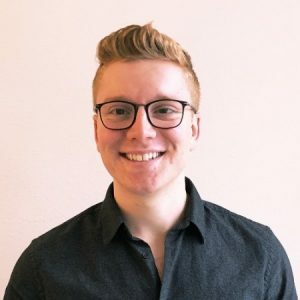 If you are only doing outreach rather than engagement, you are opening up a void where the important conversations are happening behind your back, without your involvement, away from your turf. Dig deeper into engagement strategies for long-term results in this month’s webinar, co-hosted by ELGL and Bang the Table.